Featuring the Shannon Collection and one of the newest introductions to our art inspired line of elegant turned wood natural cremation urns. 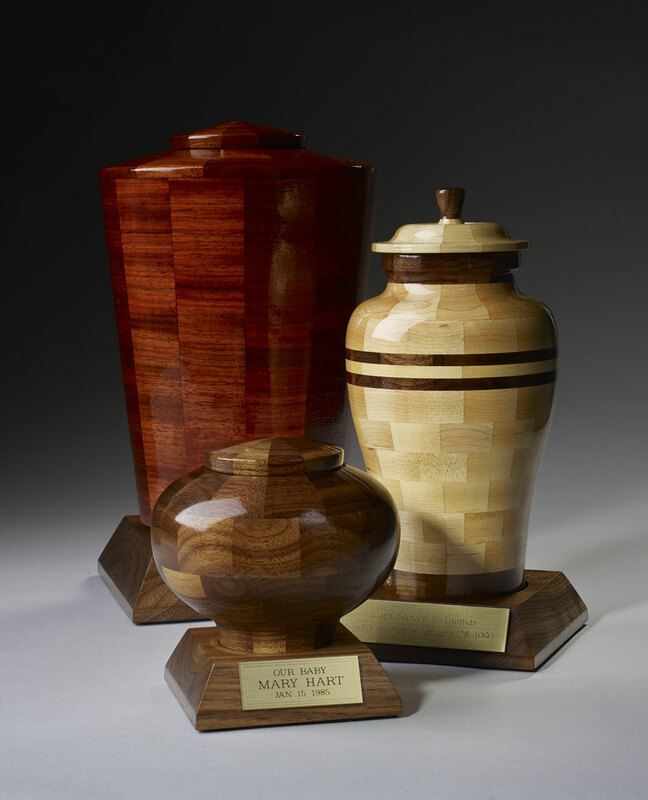 This Black Walnut urn is professionaly hand-crafted in the U.S. using various inlaid wood segments, turned, finished, and polished to perfection. Cleaning: Generally just a light dusting with a soft cloth. If more cleaining is necessary we suggest Minwax Wood Cleaner. Filling: The urn is filled from the bottom. As with all natural products, it is best to keep this urn out of direct sunlight to avoid fading. Personalization: A wood urn base and engraved nameplate are available. Please allow 1-2 business days for engraving. See example wood urn base and nameplate below the main product image. The rule of thumb is 1 pound of Healthy Body Weight = 1 CI (cubic inch) of Urn Space. So if a person weighed 200 pounds you would need an urn of approximately 200 cubic inches. Usually ships the same business day from the midwest if ordered by 1:00pm CST. Please note that the weight shown by the price is the calculated dimensional shipping weight used to by FedEx and UPS for expedited air shipments. The actual weights are shown here next to the product size.